I've written my share of blog posts about content marketing. I've also written a few comprehensive guides in my time. But I've never combined the two -- maybe because the prospect of trying to produce an in-depth version of the thing I do for a living seems too daunting. I mean, where do I start? And more importantly ... where do I stop? I won't pull any punches: I started, and it took a while to stop. That is to say you're about to dive into a pretty in-depth post (that's a nice way of saying "long") about content marketing, one which you may want to bookmark to read later. But I think it covers most of the aspects of content marketing that modern inbound marketers need to consider, beyond the basics of simply writing content optimized for the web. With that in mind, we'll plan on doing deeper dives on any subject matters covered below if you'd like them. Feel free to scan the following headers and let us know if there are any sections you think you need more help with. We'll take it from there. The most common components of a content marketing program are social media networks, blogs, visual content, and premium content assets -- like tools, ebooks, or webinars. Here are some scenarios to demonstrate the mechanics. When tax season rolls around and people are Googling answers to their tax preparation questions, they stumble upon your blog posts, and realize you offer tax preparation services. Some of them keep doing their own tax preparation, but perhaps keep you in mind for next year; others throw their hands up in the air, decide to rid themselves of tax preparation headaches for good, and hire you -- because you're clearly way more qualified to do this than they are. You're Director of Marketing for an agency that specializes in design solutions for small businesses. You're having trouble attracting customers, though, because keeping an agency on retainer seems like a luxury for a small business. So you decide to create some DIY design tools to help them, you know, DIY. You do some keyword research and notice about 2,000 people are searching for an "infographic generator" every month, so you decide to build one that people can use for free once -- and if they like it, they can create more infographics for free if they provide a name and email address. You create a few sample infographics and share them on social media so people see what the tool is capable of doing, and between that and the traffic coming from organic search, you start to get a few hundred people using it every month. A few of them like it so much they provide their name and email address so they can continue using it. Now that you have their contact information, you're able to identify some people that would be a good customer fit and keep in touch with them, nurturing them into customers. Those scenarios might have sounded like a lot of work to you, especially when considered alongside marketing programs that provide more immediate gratification -- like list purchasing, PPC, or trade show marketing that deliver names and email addresses in mere minutes. Often, content marketing is used when businesses realize those programs are either ineffective, too expensive, not scalable, or all of the above. Here's what I mean, using the "infographic generator" example above for demonstrations. Let's say you're using PPC as your primary means of generating leads for your business. You need more leads, and decide to bid on the term "infographic generator" for $2 a click. At the end of your month-long campaign, you generated 1,000 leads and spent $10,000. Not bad. But what about next month? You have to spend $10,000 again. And again. And again. That is, if you want the leads to keep coming. In other words, when you turn the faucet of money off, leads stop coming out. The same concept applies with list purchasing, tradeshow marketing -- anything where you don't own the property from which leads are generated. Now let's contrast that experience against, say, blogging. You write a blog post about your infographic generator, and included a link to the tool in the post so people can try it for themselves. Let's say the visitor-to-lead conversion rate is the same on this blog post as it was in your PPC campaign -- 2%. 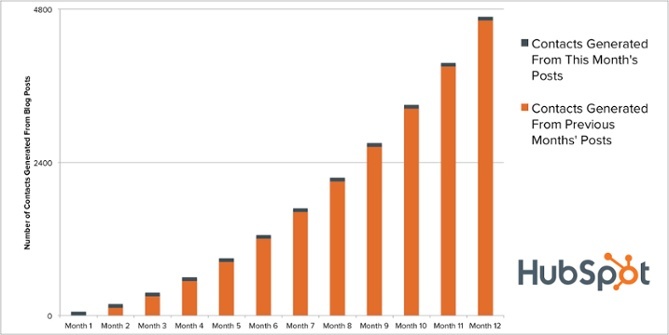 That means if 100 people read that blog post in your first month, you'd get two leads from it. But your work is done now. And over time, that one blog post you wrote years ago will continue to generate leads over, and over, and over, every single month. And not just that blog post -- every blog post you write will do the same. In other words, content marketing programs set businesses up for predictable, scalable, and cost-effective traffic and lead-flow that doesn't rely on securing budget each month. It's like an annuity. Usually, businesses don't completely cease all other marketing activities and switch to content marketing cold turkey. 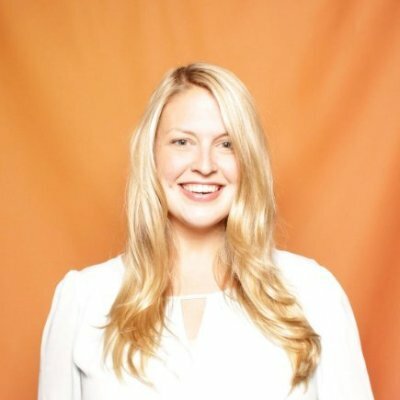 In fact, most veteran content marketing programs typically incorporate other marketing techniques to complement their content initiatives. But the impetus for most of the companies I've worked with to initiate a content marketing program has been the need for a more cost-effective, predictable, and scalable source of traffic and leads than what they've been receiving from their current marketing programs. If you're in the same boat, let's get down to brass tacks and talk about how to "do" content marketing. When you're a solopreneur or have just one person dedicated to marketing, it's pretty clear who runs content marketing -- you're a full-funnel marketer. "The best way to help your sales team is to build brand awareness and create content that generates a lot of leads over time. An increase of twice as many leads means twice as many quality leads -- as long as you have software that lets you filter those incoming leads efficiently. That's how you build a successful sales and marketing machine," explains Mike Volpe. At this stage, the work of the one or two content marketers on your team remains about the same as it does with a team of one -- content creation, SEO, and social media. Even if you decide to dedicate two hires to content marketing as Volpe suggests, to bifurcate responsibilities between those two employees is premature. Both employees should contribute to all three responsibilities, and leadership of the content marketing program is shared between those employees. This is where things get really interesting. If you've got a marketing team of about nine people, the recommendation is still to over-invest in content marketing activities that grow the top of your funnel. At this stage of growth, there's likely a CMO or other head of marketing to whom all these employees report. Thus the CMO should be leading the content marketing program, though the day-to-day activities will be carried out by the team of five. With a marketing team size of around 18, your content marketing team will be staffed with all the same roles -- bloggers, long-form content creators, SEO specialists, designers -- just multiplied. Aim to have three bloggers on staff, and two employees for each of the other roles. It's wise to have one of those bloggers have expertise in editing, too, so there's someone dedicated to maintaining content quality as output increases. At this stage of growth, it's also time to assign dedicated leadership to your content marketing team -- unless you want two dozen people reporting to the CMO. Many organizations hire a Director of Content, VP of Content, Chief Content Officer, or Editor-in-Chief to lead the entire content marketing team. This individual sets the vision for the team, secures budget, hires the right talent, contributes content ideas, solves for growth, and helps coordinate with other leaders across the marketing organization so content marketing doesn't become too siloed. Designers need to fulfill requests for employees on every team -- making them more full-funnel marketers than dedicated top-of-the-funnel marketers. You've hired content creators that are capable of doing some design on their own -- simple things like laying out ebooks, creating social images, or doing some basic front-end design work. 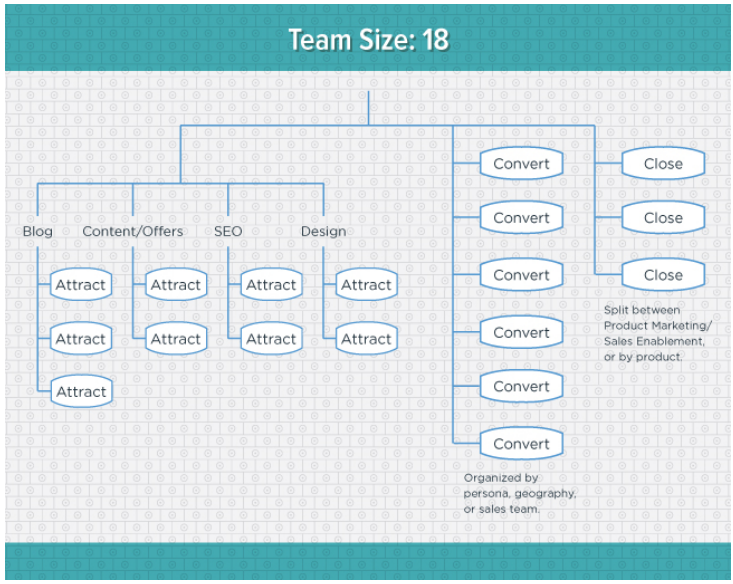 If you'd like to check out more corporate org charts to see where notable companies place their content marketing team, download The Free Guide to Organizational Structures. 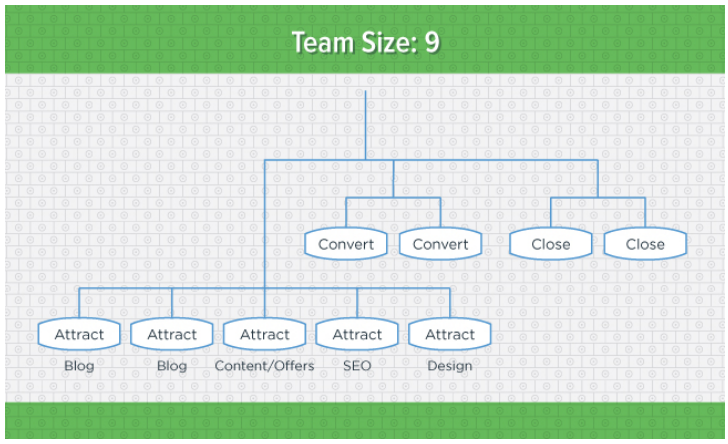 So you've seen some content marketing team structures and the different job titles you might hire for. What do these people do? And how do you hire the right people for the roles? To get you started, here are some sample job descriptions, along with the skills and qualities ideal candidates will possess. Your specific needs might vary -- for instance, perhaps you need subject matter expertise in your writers, or coding experience from your long-form content creators. Or perhaps your titles differ, and your "content creators" are actually "content strategists", or your "social media manager" is really a "specialist." Make edits as you see fit, but these frameworks should be helpful in getting you started if this is your first time hiring for any of these positions. The good thing about content marketing is that once you have the right person (or people) on your team to do it, you've got just about everything you need, save some of the basic tools and technology you need to publish content. I personally prefer things simple, so I think of content marketing technology solutions in terms of "need it" or "nice to have." Nice-to-have technologies are things like competitive intelligence tools, market research tools, or software that clues you in to real-time trends. Experiment with these on a rolling basis -- most will offer a free trial so you can validate it. But first, make sure you're set up with the core technologies every content marketing team needs. At HubSpot, we use ... well, we use HubSpot at HubSpot. It comes with a Content Management System (CMS), which allows you to create and publish content quickly in a format that's web-friendly. Whether you use HubSpot or another CMS, you need some CMS so your content marketing team can easily set up a blog, add blog posts, and add website pages without having to get help from IT or developers. You'll need some analytics for your website and blog so you can measure your content marketing performance against your goals. Some content marketing teams rely on Google Analytics, others rely on more robust closed-loop solutions that make it easy to tie content marketing activities at the top of the funnel to revenue. I recommend the latter if you want to use metrics to prove the success of your content marketing program so you can secure more budget and grow the team. If you're looking for an easy way to share numbers across your organization, look into DataHero. This tool integrates with the HubSpot software and allows you to track, visualize, and share your analytics through customized dashboards and charts. With the pace of social media and the frequency of blogging, not to mention that many of your content assets will be used across multiple campaigns and teams, a lightweight project management tool is critical. I recommend using a free software called Trello, which helps you organize your content, set deadlines, attach files, and collaborate with multiple teammates. Another great tool for keeping content projects organized from planning to publishing is Zerys -- a content marketing tool with a built-in marketplace of professional writers. Visual content plays a big role in the success of a content marketing strategy. We've found that The Adobe Creative Suite will set content marketers up with everything they need to lay out ebooks, design infographics, create social images, etc. The team will find themselves in InDesign, Photoshop, Illustrator, and Acrobat pretty frequently. For a free alternative, try Canva. This lightweight software makes it easy for designers of all levels to create quality visual content -- things like presentations, cover photos, ads etc. As I mentioned earlier, these are simply the core technologies you should look for when you're just getting started. As you scale, there are a lot of other tools and software that might be worth investment. We have the team. We have the technology. Now we have to actually start "doing" the content marketing. In this blog post, we can't cover every manner of sin when it comes to creating content, but we can go over 1) the types of content assets a content marketing team could be creating to demonstrate the breadth of the opportunities available to the content marketing team, and 2) who should be involved in creating those assets. Predictably, blog posts are typically written by the bloggers. However, if your team is large enough to have someone dedicated to creating gated assets and premium content -- things like ebooks and tools -- they should also write blog posts to help promote those assets. SEO specialists will also work closely with bloggers, as blog posts are often a company's best opportunity to improve organic search rankings. As such, bloggers should be writing posts that help improve the site's SEO, and drive organic traffic and leads. Their editorial should be informed by keyword research, and optimized for SEO. Premium or gated assets are typically longer form, and/or more time-intensive pieces that don't exist on a blog. They might be used to generate leads or contacts, or for brand-building purposes. These are typically created by the dedicated long-form content creator if your team is large enough to have one, but sometimes bloggers get involved too, as blog posts are good testing grounds for what performs well and is thus worth investing in. Tools & Templates - Because they're extremely utilitarian in nature, tools and templates often prove to be incredible for long-term lead generation despite the upfront resource-investment required. Regardless of team size, it's common for visual content to be created by nearly everyone except, perhaps, the SEO specialist. While designers will do the bulk of the advanced creative work, bloggers, content creators, and social media managers will all get involved in lighter-weight design. Often, designers will also create templates for the writers on the team so they can be more independent -- like creating ebook templates so premium content can be laid out by just about anyone with an InDesign license. Theory #1: The mere act of publishing content on a regular basis does a lot of the "distribution" work for you -- if you consider search engines a distribution channel. (Which I do, considering how often people use them to find content.) If you create content on a regular basis that's informed by keyword research and optimized for search, Google takes care of the rest of your content distribution plan. 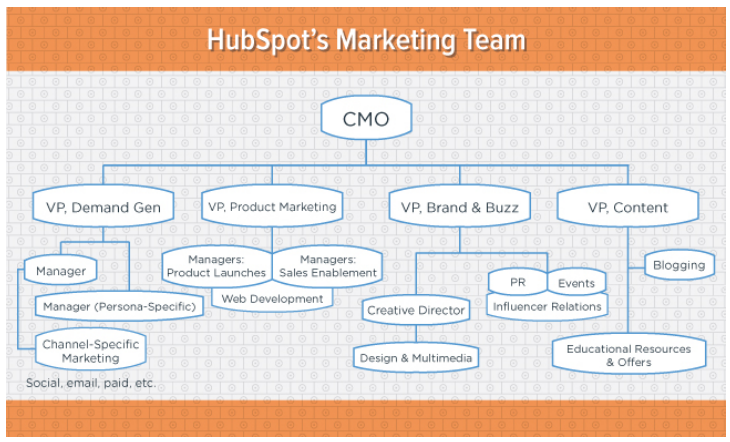 Theory #2: A lot of the content marketing teams are made up of writers, rather than marketers. In my experience, writers are less interested in marketing their content, and more interested in just writing cool stuff. Same goes for designers -- often, they would rather spend time creating something beautiful and functional than marketing it. Excuses aside, if a content marketing team is stopping short at content distribution, they're only doing half their job. It's content marketing, after all. So let's explore the most valuable channels you have at your disposal for distributing your content. While it's true Google can do a lot of the distribution work for you, it hinges on making smart decisions with your content strategy. In other words, Google might distribute the content you create, but it might distribute it onto page 32. Your job is to make sure as much content as possible appears as high up on page one as possible. This means your writers should be working closely with your SEO specialist to determine what keywords to go after -- ideally a combination of long tail terms and head terms, at an appropriate level of competitiveness given your domain authority and how aggressively you can go after the terms. Of course, that content should also be optimized for on-page SEO to improve its chances of ranking highly. The content you create should be shared on the social networks on which you're active. (And if you're not active on any, this is one of the reasons to get started.) Moreover, Google's algorithm considers social signals as one of its most important ranking factors -- socially shared content is a vote of approval, or at the very least importance, so it makes sense Google would consider it when deciding whether a post should rank well in organic search. Your social media manager should also invest in growing your presence on social networks so that the content you share reaches an ever-growing audience. Consider the amplification of a piece of content shared on a Facebook page with 100,000 fans, versus 1,000 fans. The fans' networks work to help your content spread -- so the larger their networks, the better your content's distribution. Email lists are marketer's most treasured assets -- and they're a smart way to drive traffic, conversions, and re-conversions on your content. Invest in growing your blog email subscription list for an incredibly valuable distribution arm alongside your sales lists. You can do this, for example, via lead flows that politely ask readers if they'd like to subscribe as they're reading through certain articles on your website. As the assets that were created to generate leads, measure, well, the leads generated per offer. If you're in a very sales-focused company, opportunities influenced is another strong metric. It's important to do regular reporting -- I recommend monthly -- on each of these metrics so you know where your growth levers lie. Regular reporting also helps you identify negative trends or plateaus early-on so you can address them before they become bigger issues. Most importantly, however, tracking the success of your initiatives makes it easy for you to repeat what works, eliminate what doesn't, and promote the success of your content marketing program so you can justify its expansion, and its seat at the modern marketing table.